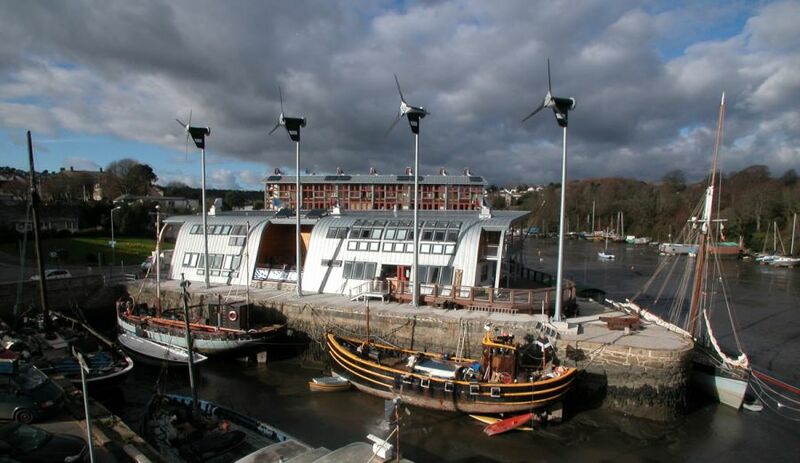 The BedZed Zero Energy project photographed here at low tide, overlooks the River Fal estuary that then leads into Carrick Roads and the English Channel. Bill Dunstan was the Architect of this £3 million project. It was commissioned and developed by Andrew Marston of Robotmother Ltd, and built by the Midas Group Ltd. The site now has the "Miss Peabody" cafe, a Yoga Center, creche and 12 other small business units plus 6 accommodation units seen behind. The windmills are manufactured by "Proven" in Scotland while the passive ventilation, solar thermal panels, woodchip boiler and Sunpipes all contribute to the Zero Energy profile and sustainability of this "green" building. Penryn is near Falmouth and the Tremough campus. Both are on the branch line rail link from Truro.